>Every weekend should be a three-day one. Does anyone ever really feel completely rejuvenated after just two days? I know I don’t. It’s only mid-afternoon on the final day of my weekend so I have plenty of time to get lots more done and relax before the work week starts. This morning my mom and I took the dogs (TLB and his Uncle Kasey) for a nice, long walk. It was freezing. I guess I got a little cocky this weekend just wearing light jackets. We both froze our heinies off and totally regretted not wearing gloves. The walk was entertaining, though, because we put the dogs on one of those dual-leash-attachment things and they looked like they were mushing in the Iditarod. Pretty cool invention, though. We’ll see how it goes with the boys and let you know in a review later down the road. I guess this post is all about Mom ’cause she introduced me to the treats on the docket for today. Thanks for lookin’ out, Ma! Blue Vanilla Bakery’s Peanut Butter Sammys! This TREAT is made locally at the Blue Vanilla Bakery in Des Moines, WA. That’s Washington, people. Not Iowa. One bag of eight treats was $4.00. 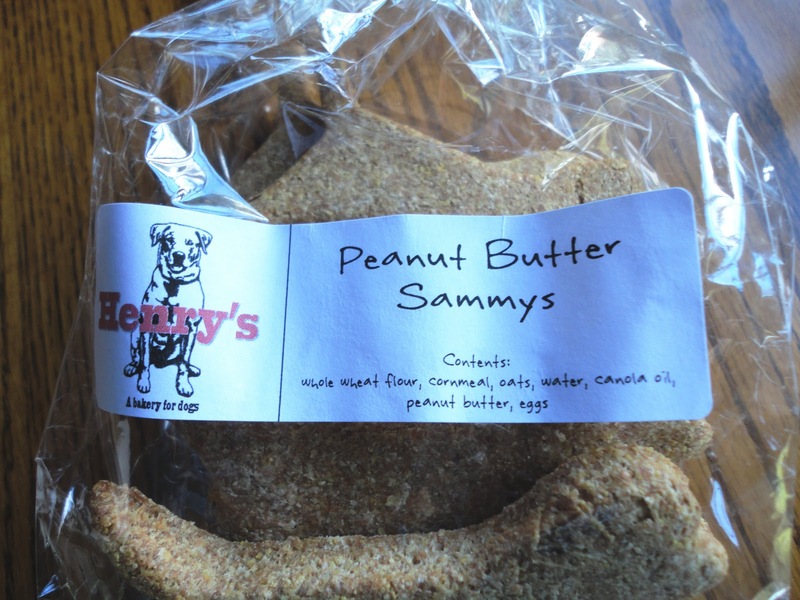 Curious as to how Peanut Butter Sammys got their name? This is probably my favorite naming story ever. There’s a story behind how we named each of the treats: In our neighborhood, we have lots of dogs and every evening several of us go walking together. It’s a chance for the people as well as the dogs to socialize. The dogs in the walking group are Samson (Sammy), Brady, Allie, Cody, Bear, Blossom, Roslyn (Ros) and, of course, Henry. There is a treat named for each of them. The last treat – Olive O’s – was named for Henry’s cousin, a little black cocker spaniel who we loved dearly. She left us on September 4, 2010. Awesome, right? It makes me want to not only buy all of the different treats, but meet all of the dogs behind them! Mom knows TLB well. He loves him some peanut butter! We’re lookin’ at whole wheat flour, cornmeal, oats, water, canola oil, peanut butter, and eggs. Ok, so not a huge fan of the flour and cornmeal since many dogs have allergies, but I’m down with all the other ingredients! Canola oil, egss, peanut butter, and oats all have great benefits. 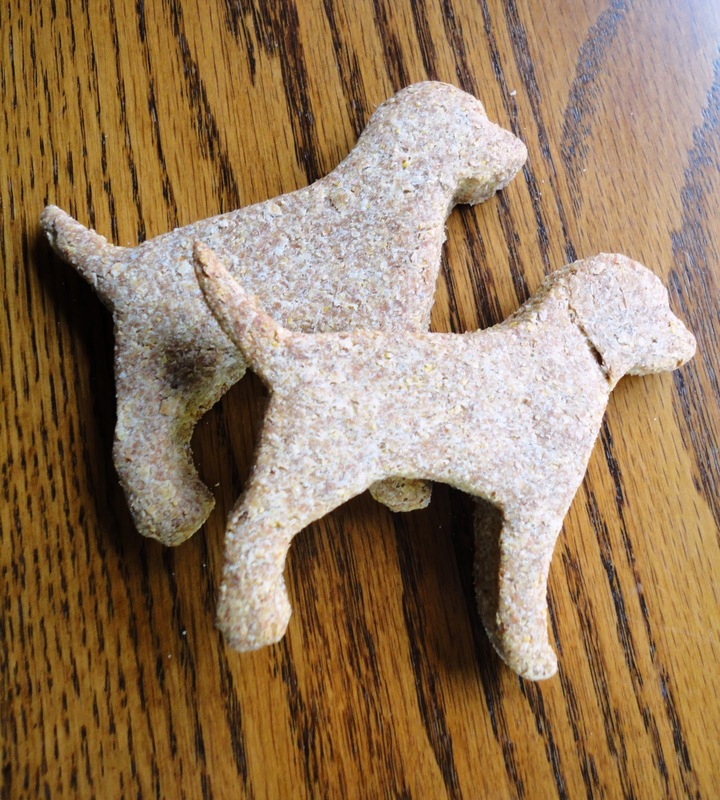 Both Kasey and Teton like these treats a lot. Mom is keeping them in the fridge since they don’t have any preservatives (yes!) which makes them nice ‘n crunchy. 1. 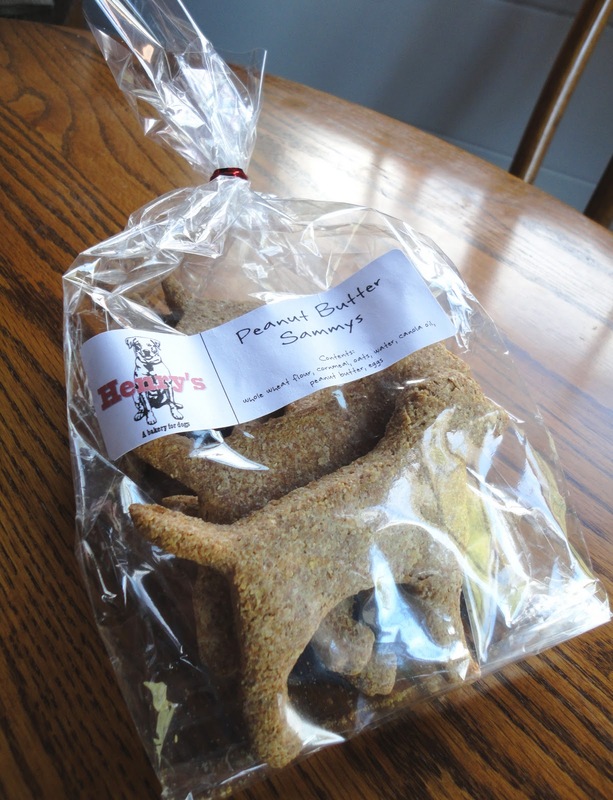 Price – $4.00 for a bag of eight fairly large treats is a pretty darn good deal if you ask me! 2. 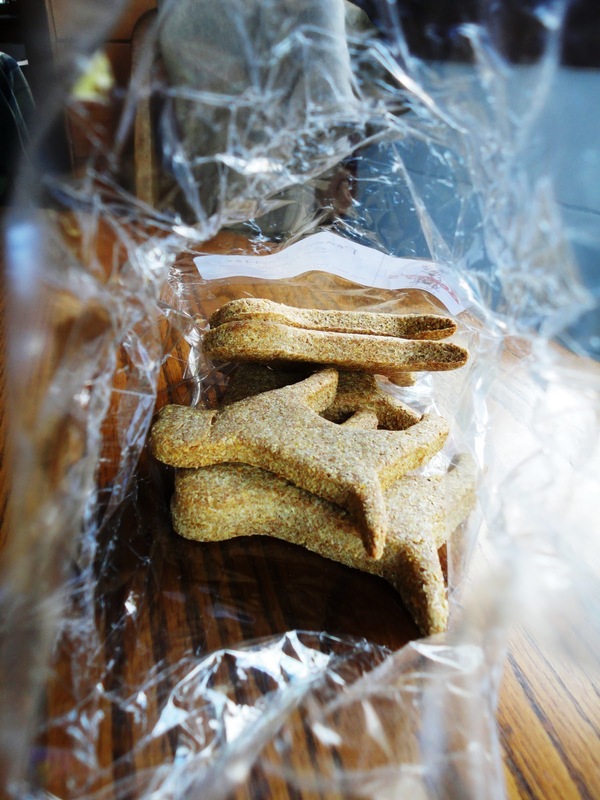 Quality – These treats are made locally in a family-owned bakery. All you have to do is read the story of how each flavor was named and you’ll know that these treats are made with love! 3. 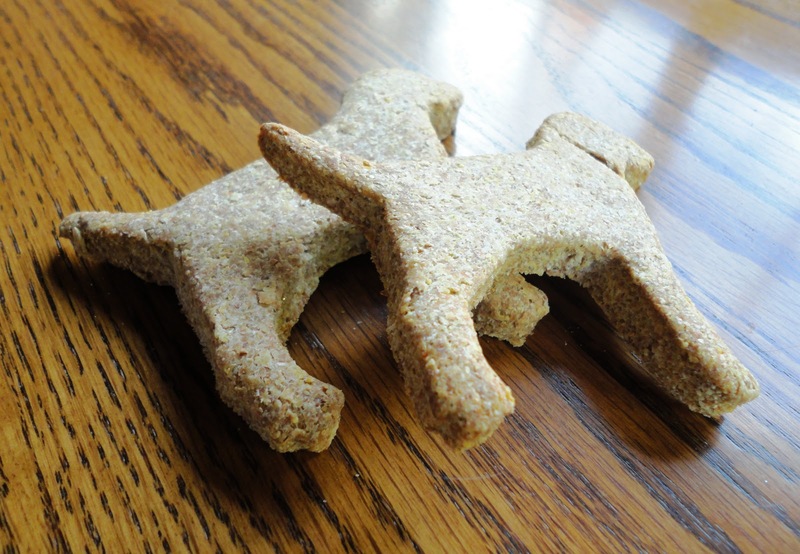 Benefits – This treat has ingredients that are beneficial to your dog’s daily health. However, it is a basic, crunchy treat so I wouldn’t say that the overall benefits are outstanding. This is a for fun treat. 4. Ingredients/Features – Blue Vanilla is pretty much spot-on. Peanut butter, eggs, and oats?! I think those are some of TLB’s favorite things! Teton hasn’t demonstrated an allergy to whole wheat flour or cornmeal, but many dogs out there have. Lose those two ingredients (but keep the rest!) and I’d be one happy blogger. 5. T-Factor – He’s not doing cartwheels (must YouTube cartwheeling dog), but he liked ’em. 6. Uniqueness/Fun – With a naming story like theirs, how can my heart not get all squishy when I think about these treats? What a fun concept. Taking into account all six rating elements, we give Blue Vanilla Bakery’s Peanut Butter Sammys a seven out of 10. They scored high on Price, Quality, Ingredients, and Uniqueness/Fun. Like I said earlier, I would classify this as a for fun treat, so the Benefits piece isn’t necessarily going to be there. Thanks for sharing your story, Blue Vanilla! And, yes, I did YouTube cartwheeling dog. Posted on January 17, 2011 May 14, 2011 by Shannon	This entry was posted in This 'N' That. Bookmark the permalink.